Where vertigo comes from is a huge question that a lot of people have. Especially because vertigo symptoms are so confusing, and can include and be confused for dizziness, nausea, lightheadedness, and even migraine, anxiety, and motion sickness. As an upper cervical chiropractor, I am very aware of the primary causes of vertigo symptoms, which can relate to problems in the ears, the eyes, and even to more serious problems in the brain. People are always asking “How do I get relief from vertigo” or “Who treats vertigo?” and they are not aware of the connection between proper neck alignment and relief of vertigo symptoms. Can vertigo be caused by neck alignment? Yes, in many cases vertigo is actually caused by problem joint alignment in the neck, especially in the first and second cervical vertebra. Below is a video that looks at the cases of a man with pretty serious vertigo, who couldn’t find relief with other forms of vertigo treatment, such as Epleys maneuver for ear crystals or canalithiasis (BPPV vertigo). 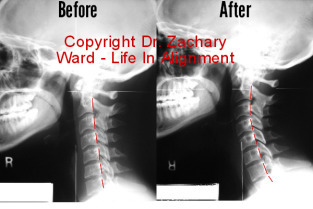 The video shows the change in the position of his neck over time, especially at the atlas bone, and the mid-cervical spine. Yes,Hello there, this is Dr. Zachary Ward here in Auburn Hills, Michigan looking at ten patients in ten minutes. neck mechanics, this gentleman decided to work with me over time to see what kind of changes we could get in his cervical curve, as well as keep that vertigo at bay. So we’re actually going to look at three x-rays spread out over four years. So,when he originally starts off this is before there’s any kind of adjustment or correction…The back of the first cervical vertebra and the back of the skull are very close to each other. The middle of the upper neck, which is right here, is very far away from the middle of the lower neck, which is back here. And then we go to the lower neck, we’re going to see between c5 and c6, is an opposite angulation taking this into a reverse cervical curve down here…As opposed to being curved forward which is where it should be. Now if we look at him a year later most of his symptoms have subsided, and we can see some shifts and changes. The back of the first cervical vertebra is coming away from the back of his skull, the middle of the top of the neck is closer to the middle of the bottom of the neck, and then when we look at c5 and c6 down here that reverse angulation has come out. And you’re seeing a straight neck down here at the bottom as opposed to it being in the beginning of that reversed cervical curve. So this gentleman would follow up with me every four to eight weeks over the next several years, and we could just continue to make sure that his neck maintained its alignment, and what we’ll see is that this stays relatively balanced, in that the c1-back-to-skull position. The middle of his neck now gets even closer to the middle portion of the lower neck, there’s no return on the reverse angulation, and overall the neck that used to be way back here, has now moved forward. If you have any question about this case or any other case you see in the series, you can go ahead and contact me via my contact box on LIAChiro.com. If you’re here in my area you’re welcome to call 248-598-4002. You will get someone immediately if you call between 10 a.m. and 2 p.m., usually. Other times it may not we may not be able to answer the phone right away or you can look me up at Facebook.com/LIAChiropractic … Have a great day!